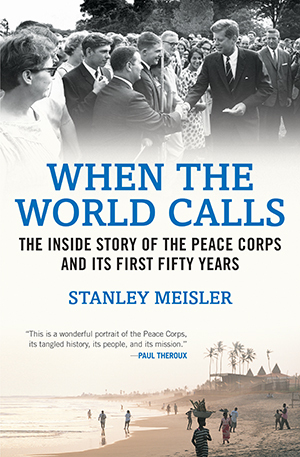 When the World Calls is the first complete and balanced look at the Peace Corps’s first fifty years. Revelatory and candid, journalist Stanley Meisler’s engaging narrative exposes Washington infighting, presidential influence, and the Volunteers’ unique struggles abroad. He deftly unpacks the complicated history with sharp analysis and memorable anecdotes, taking readers on a global trek starting with the historic first contingent of Volunteers to Ghana on August 30, 1961. In the years since, in spite of setbacks, the ethos of the Peace Corps has endured, largely due to the perseverance of the 200,000 Volunteers themselves, whose shared commitment to effect positive global change has been a constant in one of our most complex-and valued-institutions. On January 6, 1966, two Peace Corps officials embarked on a secret, reckless trip to Vietnam. The goal of their mission was to find out whether Vietnam might be a suitable country for a Peace Corps program. That goal was foolish and fanciful. President Lyndon Johnson had already dispatched thousands of combat troops to South Vietnam and ordered the continual bombing of North Vietnam. Antiwar rallies were already dominating campus life on universities throughout the United States. Peace Corps Volunteers were joining protests. Any attempt to place Volunteers in Vietnam would have crippled the Peace Corps. Even news of the exploratory trip would have damaged the Peace Corps badly. The two officials were Warren Wiggins, deputy director of the Peace Corps, and Ross J. Pritchard, director of Far East regional operations. Within the Peace Corps, Wiggins and Pritchard were known as the most fervent players of the numbers game--they relentlessly promoted massive new programs without worrying about meticulous planning. But it was not their idea to go to Vietnam. They should have resisted. But Johnson’s insistence came at a time would not take over the agency until March 1. The two officials provided a cover story and assured their hosts that the Peace Corps was prepared to lie about the mission. “We desire to avoid publicity for this visit,” they said. “If questioned here [Washington], the Peace Corps will take the position that both men are in vicinity Southeast Asia on business and interested in exploring possible role for Peace Corps Volunteers and/or other international Volunteers with refugee work in Vietnam.” There was no need to invoke the cover story. The press never spotted the adventure. In fact, hardly anyone in the Peace Corps itself knew that Wiggins and Pritchard had left for Vietnam. In Saigon, Ambassador Henry Cabot Lodge Jr. welcomed them and promised that the U.S. embassy would show them whatever they wanted to see. Wiggins and Pritchard looked at six sites, including the battleground city of Hue. In each case, their plane would spiral downward while landing to avoid gunfire. Wiggins and Pritchard decided to explore neighboring Laos as well. Their reception from Ambassador William H. Sullivan in Vientiane was far different. Sullivan was supervising what would become known as the “secret war” in Laos. CIA agents were leading guerilla units against rebels and North Vietnamese troops. U.S. military pilots, wearing civilian clothes, were flying missions in support of the Laotian government. Sullivan did not want independent-minded Peace Corps Volunteers stepping into the cauldron. After their ten-day trip, Wiggins and Pritchard wrote a report. They could not resist sounding expansive about the future. “Under different circumstances, you could put a thousand Volunteers into Vietnam,” they wrote, according to Pritchard. But in view of the dangers of the war and the backlash that a Vietnam program would unleash elsewhere in the Peace Corps, they strongly recommended against launching a program there. The conclusions of the report did not matter in any case. Vaughn, the new director, made it clear: No Volunteers would go to Vietnam, no matter what the report recommended, no matter what Johnson demanded. In at least four meetings during the next three years, Johnson pressured Vaughn to send Volunteers to Vietnam. Johnson promised they would work only in the “pacified” areas. The president said he would be satisfied even with a program of only ten to fifteen Volunteers. But Vaughn turned him down each time. Yet even as it kept out of Vietnam, the Peace Corps could not escape the war. Gerald Berreman, an anthropologist at the University of California at Berkeley, warned students in 1965, “The government wants the Peace Corps to be a playpen for activist students to keep them out of the kitchen while the adults are cooking up the war in Vietnam.” He urged them to stay out of the Peace Corps and protest the war instead. Some idealistic Volunteers hoped that the leaders of the Peace Corps would stand up to such criticism by forthrightly defying President Johnson and denouncing the war themselves. Marlyn Dalsimer, a former Volunteer in the Ivory Coast, wrote a letter to Jack Vaughn. The letter, Dalsimer recalled later, told Vaughn that “I had observed his never having made a public statement about the war in Vietnam. I told him that as head of an organization with peace’ in its name, I expected him to. We always hoped the Peace Corps would be different.” The Peace Corps was different, but not so different that its director could oppose the president openly and keep his job. As the war intensified and the awful casualties mounted, Vaughn was forced to field protests from every side of the Peace Corps--even from his own staff. Kirby Jones, the Volunteer who helped write the letter of protest to Lyndon Johnson about the Dominican invasion, worked for the Peace Corps in 1967 as the Ecuadorean desk officer. Allard Lowenstein, the militant anti-Vietnam War protester and future congressman, persuaded Jones to join him in drafting a protest letter to President Johnson. Jones then started collecting signatures from returned Peace Corps Volunteers. “I’m not going to fire you,” said Vaughn. The most publicized protest case involved a Volunteer who taught music at the University of Concepcion, in Chile. Bruce Murray and more than ninety fellow Volunteers signed a letter in 1967 protesting the bombing of North Vietnam and calling for negotiations to end the war. The Volunteers planned to pay for the publication of the letter as an advertisement in the New York Times. But after local Peace Corps officials discovered what was going on, Ambassador Ralph Dungan warned the Volunteers they could be thrown out of the Peace Corps if the letter were published. A similar warning came from Vaughn. Faced with these threats, the Volunteers abandoned their project. But Murray was angered by Vaughn’s restrictions on the rights of the Volunteers to speak out on American issues. In a letter to Vaughn, Murray accepted the stricture that Volunteers “should not meddle in the politics of the host country.” But he argued that this restriction should not prevent Volunteers from speaking out on “international policies of the United States which may be of interest to the host country.” He sent a copy of this letter to the New York Times, but the newspaper did not publish it. The news agency United Press International (UPI) found out about the controversy and released an article describing the suppression of Volunteer antiwar protests by the Peace Corps. The article was published in the newspaper El Sur of Concepcion. Murray felt that the UPI article did not state the position of the Volunteers fully, and he sent El Sur a Spanish translation of his letter to Vaughn. The Chilean newspaper published it. The Peace Corps retribution was swift. Country director Paul Bell ordered Murray home, ostensibly for “consultations.” When Murray arrived in Washington, he found that no consultations were scheduled. He had already been dismissed from the Peace Corps. In the wake of the Murray controversy, Vaughn retreated. He set down regulations, revised them, and, in any case, no longer disciplined anyone. As the war ground on, killing many young Americans and many more Vietnamese, the pressure on Volunteers to cry out intensified. Vaughn decided to trust in the good sense of the Volunteers. A formula of sorts evolved. The Peace Corps administration agreed that the Volunteers, unlike members of the armed forces, had the right to speak out and protest U.S. policy if they saw fit. In turn, the Peace Corps wanted the Volunteers to accept two limitations on their freedom of speech: They must not interfere in the internal politics of the host country, and their actions must not harm the Peace Corps. But the formula was fragile, dependent on interpretation. When Murray was dismissed, a spokesman for the Peace Corps had said, “The Vietnam War is a major issue in Chile, and it has been the policy of the Peace Corps not to get involved in any local political issue.” This, of course, was a good deal of a stretch--it would be difficult to find any controversial U.S. foreign policy that was not a political issue in most other countries. Afterword Does the Peace Corps Do Any Good? Since its inauguration, the Peace Corps has been an American emblem for world peace and friendship. Across the nation, there are 200,000 former volunteers, with alumni including members of Congress and ambassadors, novelists and university presidents, television commentators and journalists. Yet few Americans realize that through the past nine presidential administrations, the Peace Corps has sometimes tilted its agenda to meet the demands of the White House. Stanley Meisler discloses, for instance, how Lyndon Johnson became furious when volunteers opposed his invasion of the Dominican Republic; he reveals how Richard Nixon literally tried to destroy the Peace Corps, and he shows how Ronald Reagan endeavored to make it an instrument of foreign policy in Central America. But somehow the ethos of the Peace Corps endured. Stanley Meisler, the author of two other books, was a foreign and diplomatic correspondent for the Los Angeles Times, Foreign Policy, the Atlantic, the Nation, and Smithsonian, and lives in Washington, D.C.
Dean Rusk, the Secretary of State, stated that "the Peace Corps is not an instrument of foreign policy because to make it so would rob it of its contribution" (p. 71). Drawing from the political crisis that occurred in the Dominican Republic in chapter six, do you think Volunteers can successfully harmonize their own political interests with those of the U.S. government? In 1967, Bruce Murray and ninety fellow volunteers signed a letter protesting the bombings of North Vietnam and calling for negotiations to end the war. After receiving a warning from Ambassador Ralph Dungan, Murray admits that volunteers should not be involved in the politics of the host country. However, he also argued that volunteers had the right to speak out about the international policies of the United States that may be of interest to the host country. Given the history of an American presence on foreign soil, would you agree with Bruce Murray's argument? Why or why not? After the death of JFK and the widely publicized protest against the Vietnam War by Peace Corps Volunteers, Richard Nixon looked for ways to tarnish the good image of the Peace Corps. Describe the cunning methods President Nixon used to eradicate the existence of the Peace Corps. Did he succeed? Provide examples from the book to support your answer. Chapter twelve discusses the case of a Peace Corps Volunteer being convicted of homicide in Tonga. Describe the Peace Corps' presence or absence in the trial of the convicted. Do you agree that the Peace Corps should defend all of its Volunteers, regardless of the circumstance? Should individuals be granted diplomatic immunity while serving in other countries? Why or why not? Many former members have gone on to write memoirs recounting their experiences in the Corps. Chapter fourteen provides detailed accounts of three former Peace Corps Volunteers. Describe each Volunteer's experiences. How were their experiences similar and/or different? What personal challenges did Volunteers face? In addition, how did the memoirs of the former Volunteers change the reputation of the Peace Corps? In the summer of 2005, President George W. Bush appointed Michael Retzer as the new US ambassador to Tanzania. Unfortunately, not everyone would agree with the new ambassador's decision making process. Describe the conflicting relationship between Mr. Rezter and Christine A. Djondo, the Peace Corps Country Director. What were some of Mr. Retzer's controversial decisions and how did it affect the Peace Corps? Did his actions also affect how others viewed him? Consider the statement written in the letter of instructions found on page 205. Afterward: Does the Peace Corps Do Any Good? While serving in other countries, Peace Corps Volunteers have sometimes found themselves involved in politics, especially when it concerns the issue of war. Drawing from the example of Bruce Murray (Chapter 8, pages 98106), who protested against the Vietnam War, and Aaron Kauffman (chapter 17, pages 192193), who protested against the war in Iraq, would you conclude that politics will always be an integral part of the Peace Corps? Since it inception in 1961, the Peace Corps has undergone many changes, especially with its directors. While some of the directors have led the Corps successfully, others have failed, scarring the image and reputation of the Peace Corps. Based on the history of each director, what lessons can be learned? What should future American presidents consider when appointing directors to lead the Peace Corps? Consider comparing and contrasting the legacy that each director has left at the end of their term or resignation.